Many traditional UMAs fall down when it comes to creating clarity for clients and scalable efficiencies for advisory businesses. And advisors know that striking the right balance between these two goals is easier said than done. 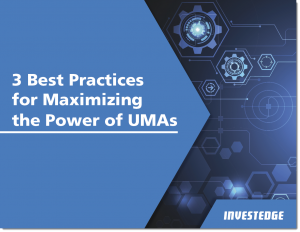 In our latest eBook we are introducing a new breed of UMA which offers more flexibility to clients while delivering operational efficiencies, control and oversight to advisors and firms. Where other UMA solutions fall down, InvestEdge’s UMA stands up. Download our latest eBook which focuses on the criteria advisors should use when seeking the right solution for their firm.